A powerful X1-class solar flare erupts from the un on March 29, 2014 in this extreme ultraviolet wavelength image captured by NASA's sun-watching Solar Dynamics Observatory. The sun unleashed a major solar flare on Saturday (March 29), causing a radio blackout for several minutes on Earth, space weather experts say. 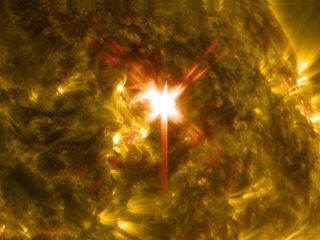 The brief X1-class flare erupted from the now decaying sunspot AR2017 at 1:48 p.m. EDT (1748 GMT) on Saturday, according to a report from the NOAA-led Space Weather Prediction Center. Although AR2017 is dissipating, it may still produce more solar flares in the coming days, the report stated. NASA's Solar Dynamics Observatory caught sight of the solar blast, capturing video of the huge solar flare. NASA's powerful Solar Dynamics Observatory captured this stunning full-disk view of the huge X1 solar flare of March 29, 2014. According to NOAA's update, the weekend solar flare and several recent eruptions of super-hot solar plasma (called a coronal mass ejections) could trigger a minor geomagnetic storm on April 2. The storm may amplify Earth's northern lights displays, astronomer Tony Phillips wrote on Spaceweather.com. The northern and southern lights are created when charged particles from the sun come into contact with particles in Earth's atmosphere. The particles from the sun are drawn to the Earth's poles by the planet's magnetic field, creating the dancing lights in northern and southern latitudes. While the flare did black out terrestrial radio signals, it also produced radio signals, Phillips said. "The explosion above sunspot AR2017 sent shock waves racing through the sun's atmosphere at speeds as high as 4800 km/s (11 million mph)," Phillips wrote. "Radio emissions stimulated by those shocks crossed the 93 million mile divide to Earth, causing shortwave radio receivers to roar with static." When pointed directly at Earth, powerful solar flares can pose a threat to astronauts, satellites and other spacecraft in orbit. The sun is in an active phase of its 11-year solar cycle. The star shot off an X-class flare at the beginning of January and another powerful X-class solar flare in February.